The LoveStoryProject is an ongoing project. In Zusammenarbeit mit dem Goethe-Institut Kairo. The [LoveStoryProject] is a growing collection of stories and thoughts about love. It started in Cairo in 2003 when Florian Thalhofer and Mahmoud Hamdy asked friends to explain their definition of love. In 2004 students from the Nanyang Academy of Fine Arts in Singapore posed this question to their friends. In 2005 the [LoveStoryProject] was invited to the Fringe-Festival in Dublin. In September 2006 more interviews were made for the Berlin Blind Date Party, organized by Jim Avignon at Galapagos Art Space in Brooklyn, New York. For this venue we published an online survey that you can still participate: XXLove-survery. People from very different cultural backgrounds talk about one common phenomenon: love. Without claiming universal validity, the answers provide a new perspective on your own and the other culture. The [LoveStoryProject] is a database-driven video-archive that can be viewed in a computer-installation or over the internet. The [LoveStoryProject] is an evolving and dynamic documentary-film. A film that never is the same twice. This Project was initiated by Florian Thalhofer and the Goethe-Institute, Cairo. The [LoveStoryProject] is generated with the aid of [korsakow-system], a software application for the creation of database-driven and interactive film. This software was invented by Florian Thalhofer and further developed together with Willem Velthoven at the University of the Arts, Berlin and German Literature Institute at the University of Leipzig. Fachkraft for interactive narration, media artist, gives lectures at the University of the Arts, Berlin, inventor of the [korsakow-system], suspected in garden dwarf robbery. Independent Film maker, Photographer, Bachelor Degree at the School of Fine Arts, Cairo in "Graphic Animation". Graphic and interior designer, bachelor degree at the School of Fine Arts. Studies at the UdK, Berlin. Music composer studying at the School of Fine Arts, Cairo "Art Direction " experienced in film scoring and music for theatrical preformances. Student at the University of the Arts, Berlin. Specialized in wishful thinking, dedicated fan of the [korsakow system] camoufloating dialogue. Photographer, studying arcitechture at the School of Fine Arts, Cairo. 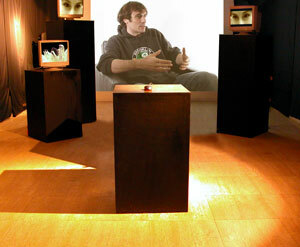 Intrested in media art and documentary film making. Translator of romance novels, love manuals and other classics. Still trying to bridge the gap between theory and practice. Photographer, studying advertising, intrested in movie industry, media art and graphic design. Bachelor Degree at the School of Fine Arts, Cairo in "Graphic Animation". Currently a senior graphic designer in an advertising agency in Dubai. Multimedia designer, studying at Nanyang Academy of Fine Arts, Singapore. Always interested in new challenges and have an interest in photography.